Reinhard Tristan Eugen Heydrich (German: [ˈʁaɪnhaʁt ˈtʁɪstan ˈɔʏɡn̩ ˈhaɪdʁɪç] ( listen)) (7 Mairch 1904 – 4 Juin 1942) wis a heich-rankin German Nazi offeecial during Warld War II, an a main airchitect o the Holocaust. He wis an SS-Obergruppenführer und General der Polizei (Senior Group Leader an General o Polis) as weel as chief o the Reich Main Siccarity Office (includin the Gestapo, Kripo, an SD). He wis an aw Stellvertretender Reichsprotektor (Depute/Actin Reich-Protector) o Bohemie an Moravie. Heydrich served as preses o the Internaitional Creeminal Polis Commission (ICPC; later kent as Interpol) an chaired the Januar 1942 Wannsee Conference, that formalised plans for the Feenal Solution tae the Jewish Quaisten—the deportation an genocide o aw Jews in German-occupied Europe. Mony historians regaird him as the daurkest feegur within the Nazi elite; Adolf Hitler descrived him as "the man wi the airn hert". He wis the foondin heid o the Sicherheitsdienst (SD), an intelligence organisation chairged wi seekin oot an neutralisin resistance tae the Nazi Pairty via arrests, deportations, an murthers. He helped organise Kristallnacht, a series o co-ordinatit attacks against Jews ootthrou Nazi Germany an pairts o Austrick on 9–10 November 1938. The attacks, cairied oot bi SA stormtruipers an ceevilians, presaged the Holocaust. 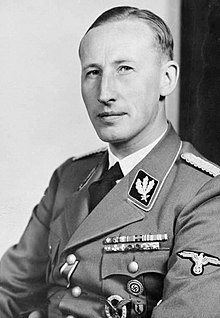 Upon his arrival in Prague, Heydrich socht tae eliminate opposeetion tae the Nazi occupation bi suppressin Czech cultur an deportin an executin members o the Czech reseestance. He wis directly responsible for the Einsatzgruppen, the special task forces that traivelled in the wauk o the German airmies an murthert ower twa million fowk, includin 1.3 million Jews, bi mass shuitin an gassin. Heydrich wis creetically woundit in Prague on 27 Mey 1942 as a result o Operation Anthropoid. He wis ambushed bi a team o Czech an Slovak augents that haed been sent bi the Czechoslovak govrenment-in-exile tae kill the Reich-Pertector; the team wis trained bi the Breetish Special Operations Executive. Heydrich dee'd frae his injuries a week later. Nazi intelligence falsely airtit the assassins tae the veelages o Lidice an Ležáky. Baith veelages war razed; aw men an boys ower the age o 16 war shot, an aw but a haundfu o the weemen an childer war deportit an killt in Nazi concentration camps. This page wis last eeditit on 31 Julie 2018, at 23:17.